Nebraska's Columbus Races are held annually at the Platte County Agricultural Society Park in Columbus. Exciting thoroughbred races are hosted at Columbus Park between the months of July to September during which time the Annual Platte County Fair takes place in July. 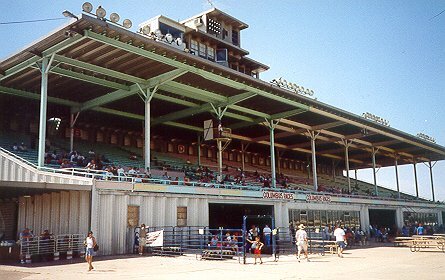 Columbus Park has been in operation for around 65 years and attracts large numbers of racing enthusiasts. The Columbus Races between July and September are held on Fridays, Saturdays and Sundays as well as on Labor Day. Live thoroughbred racing can be enjoyed on the main dirt track which measures 5/8 mile. Post times are as follows: Fridays and Saturdays at 7:00 pm; Sundays and Labor Day at 2:00 pm. Admission to the thrilling thoroughbred races at Columbus Park is free. Platte County Agricultural Society Park in Columbus has a full simulcast racing schedule throughout the year. Featuring race tracks from all over the United States, racing fans can view simulcast races on Thursdays to Sundays. Simulcasting is hosted in the air-conditioned clubroom. The awesome Columbus Races are simulcasted at the following venues: Horsemen's Park of Omaha, Prairie Meadows in Altoona, State Fair Park of Lincoln, Grand Island's Fonner Park, Atokad Park of South Sioux City, Kansas' Woodlands and Canterbury Park in Minnesota. Simulcast racing is available from noon to 8:00 pm. Dining options at Columbus Park are Hanson's Food and Triple Crown Restaurant.